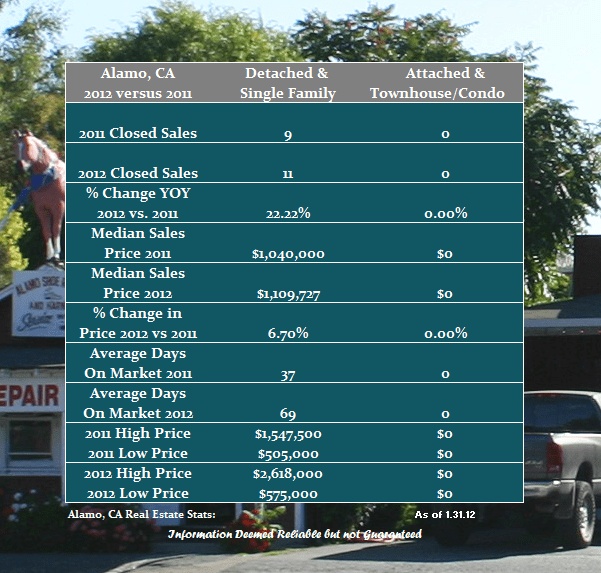 Well it’s time again to start another year and take a look at how real estate in Alamo is performing versus the year gone by. At this point the data is thin so it is difficult to draw any lasting conclusions as to the direction of the 2012 market. As we go through the next few months we will get a pretty good idea of the health of local housing. One thing is for certain: Alamo has experienced a nice jump in activity at the higher end with several homes over $2,000,000 finding buyers including one at $11,800,000. Do you have specific questions about real estate in Alamo? Give me a call! Share the post "Alamo’s January Real Estate Update"